Topics: A Candy Store, Faqs, Wrapped Bulk Candy, Unwrapped Bulk Candy, and Candy Bars. The estimated 1,310 daily visitors, each view 2.70 pages on average. tistasty.com Oregon Jams & Jellies Gourmet Foods All Natural Sweet Pickles ..
Inktomi Corporation (California, Sunnyvale) is the location of the YTS/1 server. Its 4 DNS Records include, yns1.yahoo.com, yns2.yahoo.com, and ns8.san.yahoo.com. 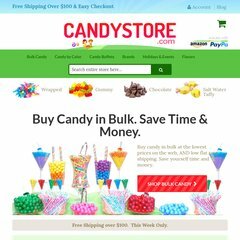 Acandystore.com's IP address is 68.142.205.137. Website load time is 1498 milliseconds, slower than 47% of other measured websites. As well, a ping to the server is timed at 33.5 ms.